Jan system, Lonetrek region. On the 30th of October at 21:00 EVE Standard Time, Imperium forces clashed with Project.Mayhem. [16-13] over a tower in the system. The tower belonging to Tactical Narcotics Team [TNT] was reinforced by Project.Mayhem. and the Imperium was gearing up to protect it. The Imperium mustered approximately 300 pilots divided into 4 fleets: 3 Cerberus Heavy Assault Cruiser fleets and 1 Ferox Battlecruiser fleet. Against them Project. Mayhem. assembled a 65 pilot Machariel Battleship fleet with Triage Archon Carrier support. First in the system was a Tactical Narcotics Team Cerberus fleet which positioned itself on the tower grid. Project.Mayhem. entered after it from the Nalvula system and warped to the station in order to allow its Triage support to catch up with the main fleet. Once its initial Triage Archon was present with the fleet, the force warped to the tower at 50 kilometers, setting up for the fight. At the same time, The Bastion [BSTN] Cerberus fleet entered the system and the Tactical Narcotics Team warped to 100 kilometers of the Project.Mayhem. fleet, starting the fight. The first exchanges went badly for Imperium forces. The 2 Cerberus fleets were unable to inflict damage on the Project.Mayhem. fleet which tanked their missile barrages with ease while they themselves lost mainline ships to the artillery fire of the Machariels. The battle quickly settled into a rhythm of the Cerberus fleets warping at range of the Machariels, exchanging fire only to lose a ship or two then warping off again. After several bruising exchanges, the RAZOR Alliance [RAZOR] Cerberus fleet and the Imperium Ferox fleet entered the system and joined the fray, altering the course of the battle. With their reinforcements in, Imperium forces were able to break the Project.Mayhem. fleet, as the combined firepower of 4 fleets was too much for it to handle, even after it brought a second Triage Carrier in. However, Project.Mayhem. forces did not retreat and continued to exchange fire, managing to inflict further losses on the Imperium. As this was going, Pandemic Legion [-10.0] forces entered the system. Pandemic Legion brought an 80 pilot Proteus Strategic Cruiser fleet in support of Project.Mayhem. and raced towards the system of Jan utilizing wormholes in order to assist in the battle. Upon entering the system, the fleet warped to a perch on the grid before attempting to land on one of the Cerberus fleets which was kiting around the Project.Mayhem. Machariels. As Pandemic Legion forces landed on top of the Cerberus fleet, it managed to warp away, forcing Pandemic Legion to change targets. The Pandemic legion fleet managed to warp on top of the Ferox fleet next after it was driven away by the Project.Mayhem. Machariels. This time the Pandemic Legion fleet was able to snag most of the fleet’s ships and started the brutal process of annihilating it. With the Ferox fleet obliterated and Pandemic Legion forces on the field, the Imperium fleets started retreating. 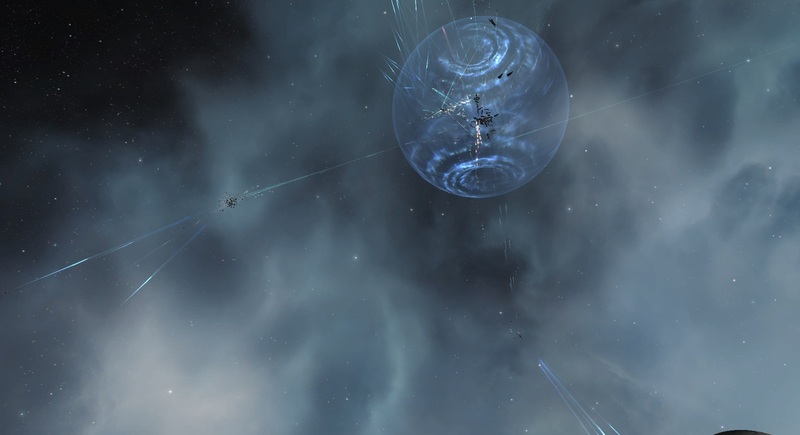 Pandemic Legion attempted to give chase and caught a few stragglers on the Jan gate in the Nalvula system, but overall most of Imperium forces managed to reach the safety of the Tribute region. At the same time, Tactical Narcotics Team for unknown reasons reset the password of its tower. This caused one of the Triage Thanatos Carreirs located inside to be launched out of the tower’s shields. Project.Mayhem. quickly nabbed the Carrier, making short work of it while its brethren docked in the system. With the Imperium forces routed, Pandemic Legion and Project.Mayhem. quickly destroyed the tower, claiming both the strategic and tactical victory. With the moon secured for Project.Mayhem., both fleets safely extracted, ending large scale hostilities in the system. All told the battle lasted 50 minutes with local peaking around 500 pilots at the height of the fighting and Time Dilation being a noticeable factor, staying at 50% to 40% range for most of the fight. Imperium forces lost 57 ships including 1 Carrier, 16 Combat Battlecruisers and 16 Heavy Assault Cruisers for a total of 11.62 Bil ISK damage. Project.Mayhem. and its allies lost 7 ships, all of which were Machariel Battleships for a total of 10.27 Bil ISK damage. i like it, and i love seeing pl doing what they used to with shadoo. running around in t3s and actually taking the fights. glad to see the old PL spirit is still there. After I read the second paragraph I was sure this was going to be a very boring, very one-sided battle.